Volunteer Week is May 21-26th! Plan now to join us!!! Volunteer relationships are very important to the life of the camp. Church and scout groups, families as well as individuals have all been involved in various volunteer projects at the camp. Projects vary depending on the skills of the group. 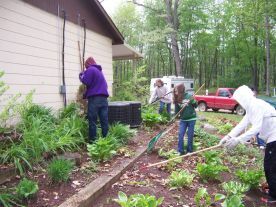 Often groups are able to mix some camp recreation activities into their volunteer project. Some groups even make it a part of their retreat. Contact Rob Lewis to schedule your volunteer project.